Illustrations from Peregrine Pickle, various artists, 1781, British Museum. 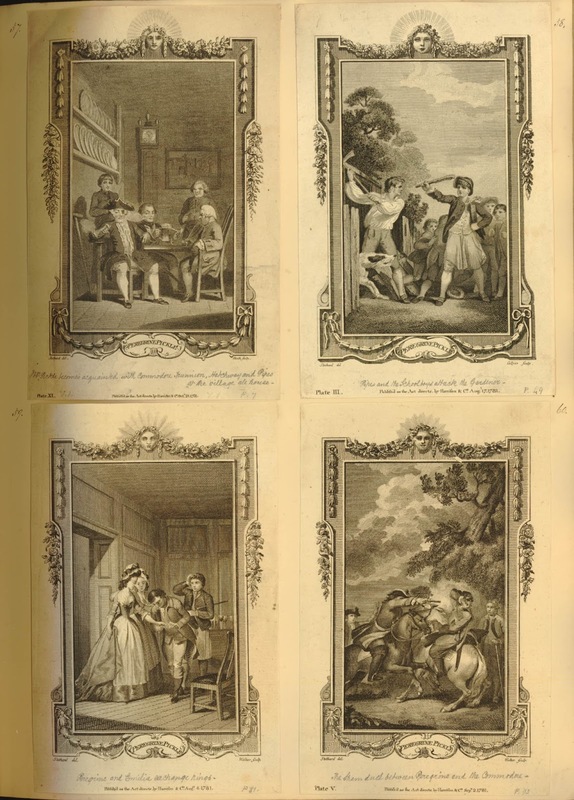 These copperplates were engraved for The Novelist's Magazine and depict scenes in the Tobias Smollet novel The Adventures of Peregrine Pickle. The title character is raised by a former Royal Navy commodore and his cohort of mariners. Thankfully for us, several of these cuts depict those mariners in action. 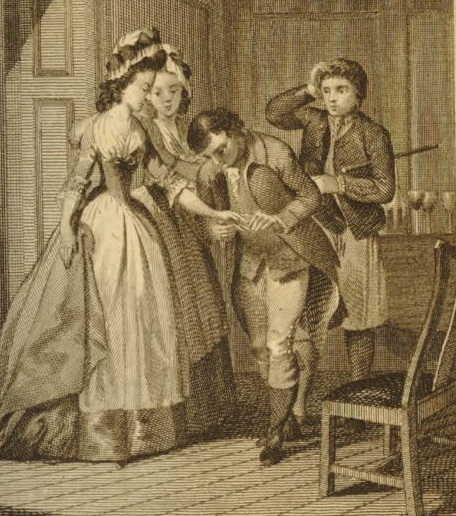 The first scene is the same as that shown in the 1769 edition of the novel that I featured here. 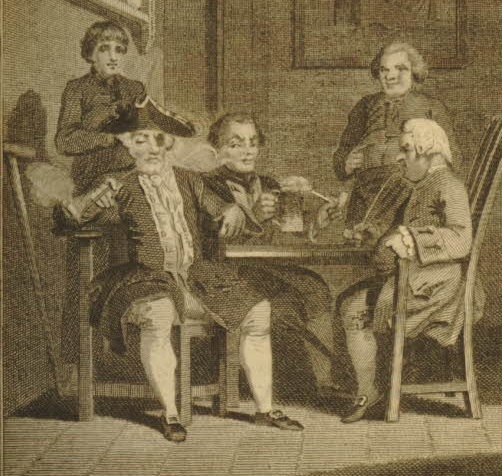 Unlike the 1769 edition, the commodore and most of his companions are dressed as gentlemen or officers. This may reflect the observation of N.A.M. Rodger in his history of the Georgian navy: The Wooden World. Officers and men were not as starkly divided in the mid-century as many popular histories portray. The division between them became much more classist and defined by the end of the century. Separated by two decades, these two separate prints demonstrate that in the dress of their characters. Interestingly, boatswain's mate Tom Pipes is still in the dress of a common tarpawlin. 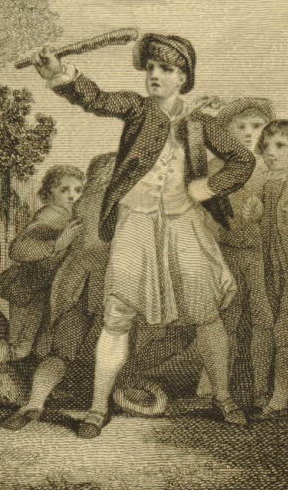 He is hatless with short hair, wearing a single breasted jacket, and carrying a sailor's stick. He wears a pair of slops/petticoat trousers. At his neck is an oddly shaped black neckcloth. This may be the mysterious gorget type badge seen in the 1762 illustration of a bosun featured here. I turned to the Internet Archive, which hosts a digitized copy of the Novelist's Magazine, Volume VI. It has a slightly higher resolution image of this engraving, but not high enough to be definitive. The next scene gives us a better (and more humorous) image of Tom Pipes: leading children in an attack on a local gardener. Pipes wears a loose fitting cap, white neckcloth, single breasted white waistcoat without pockets, single breasted jacket with clash cuffs that ends about the top of the thigh, plain slops/petticoat trousers, white breeches, white stockings, and pointed toe shoes with rectangular buckles. In his right hand, raised in defense, is a cudgel. Tom watches as Pickle exchanges rings with his love. Though relegated to the background, Tom Pipes still has a lot to offer us. His jacket is single breasted, but the artist couldn't settle on a style of cuff. His left arm ends in a buttoned down mariner's cuff, but his right features a small slash. Under his left arm is tucked a short stick, and in his right hand is a cocked hat. At least, I presume it is a cocked hat, it is difficult to tell. Again he wears plain slops/petticoat trousers.